The gondola ride is incredible, very steep and the views across the valley are breathtaking! Views from the trail of the world famous Eiger, Mönch and Jungfrau mountains. Visiting a huge frozen waterfall. Bombing down a mountain in the Swiss Alps! You'll either meet at the base or be collected at one of the pickup locations and taken to the base. The aim of the game is to dress for success. You’ll be in the outdoors, you’ll be in the snow AND it’s winter… so let’s set you up to stay warm and dry so you can have the most fun possible! 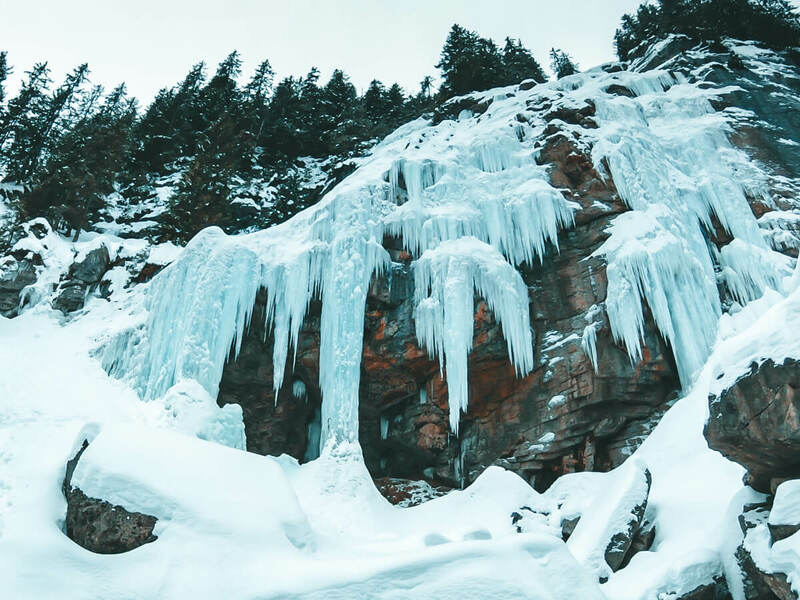 Winter jacket, snow pants, waterproof hiking boots, beanie and waterproof gloves are the basics… and ideally, you’d have a thermal layer close to your skin and long socks… snow down your shoes is not a good time! 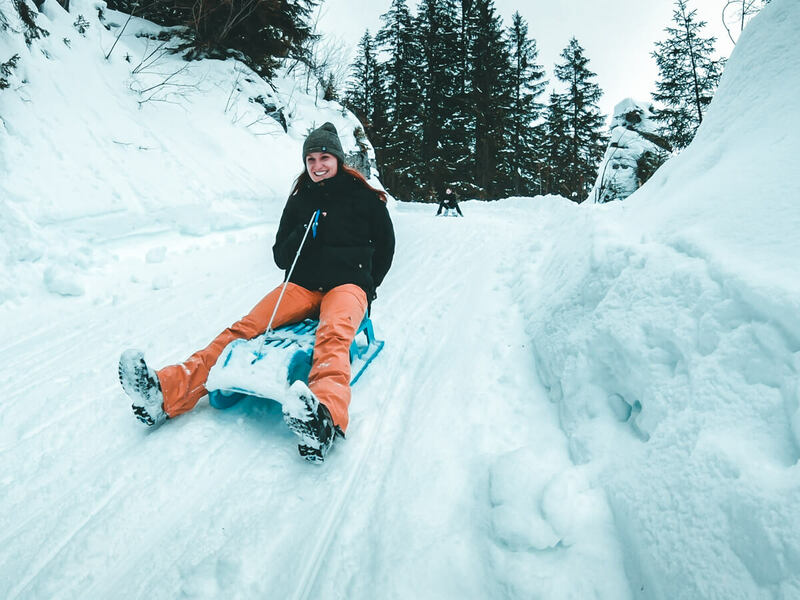 Pro Tip: Try and avoid anything which might get caught in the sled… long scarves, bags with long straps etc. 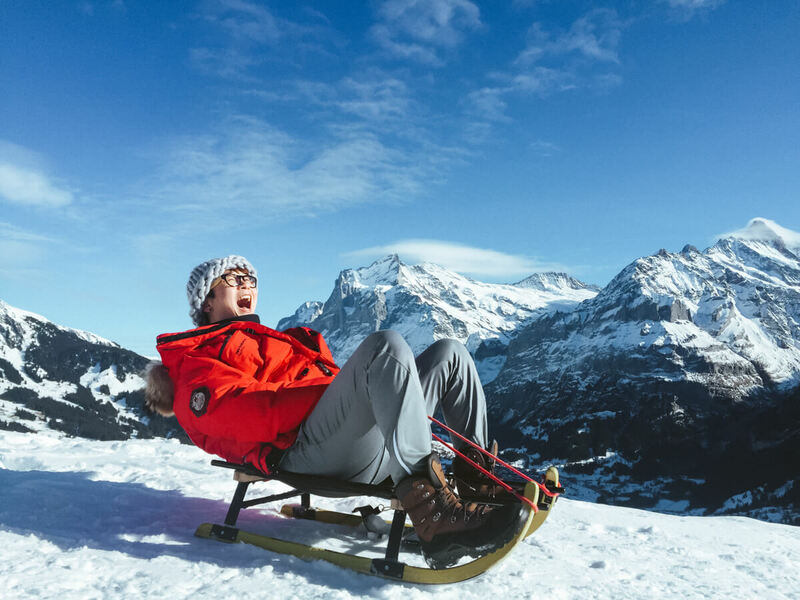 It's about a 15min drive from the Outdoor Interlaken base to the gondola station, and you'll head up towards the Lauterbrunnen and Grindelwald valleys... which is always stunning! Once we arrive, we park up, gather the troops and stroll on over to our storage barn (just a few mins). We'll pick up the sleds, sledges, sleighs, toboggans, luges? and head to the gondola. The gondola is fairly quick, but the altitude covered is huge! In true Switzerland fashion, you'll be amazed at how steep the gondola runs up the mountainside. Don't forget to look around, as you rise above the trees, the valley's and mountains come into view and are breathtaking! 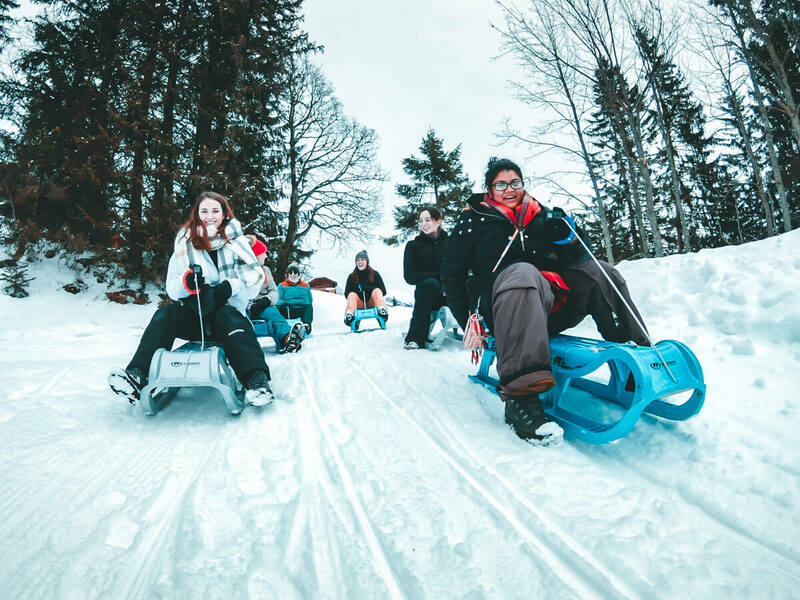 Sledding is not so difficult, the trail we use is quite wide and gentle. You can also control your speed, so it’s up to you! After much testing, we have found it is usually the best way 😉 we think it’s easier because you can see what’s coming? This gives you space to put your legs up when you want to and steering is a little easier. It also helps for those "pull up on the front, emergency braking situations". Dig both heels into the snow and keep applying pressure into the snow until you've come back from ludicrous mode. Dig one heel into the snow. The heel on the side you want to turn. That's all there is to it... one helpful tip might be to look ahead, and start initiating the turn a little earlier than you think. Always keep one hand holding onto the rope which is attached to the front of the sled. 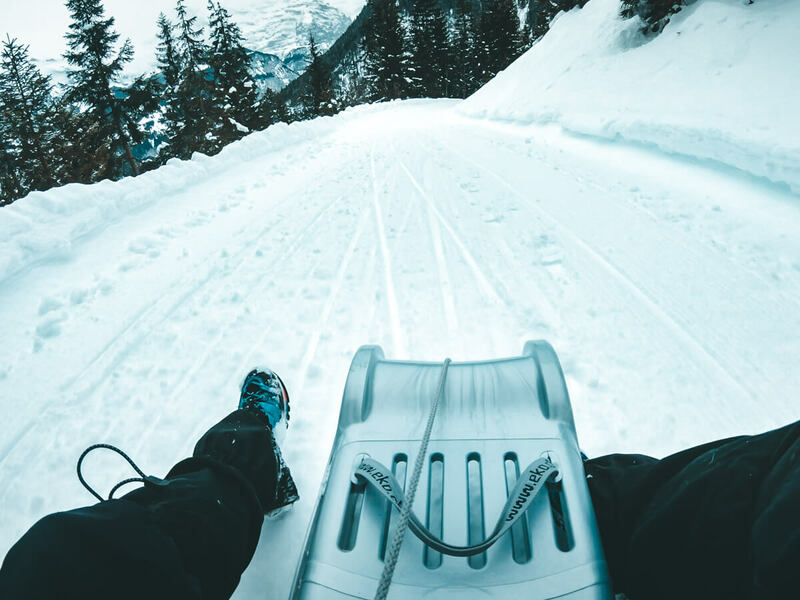 This can not only be used to pull up the front of the sled to slow down even quicker (advanced technique), but also for making sure you don’t lose your sled should you feel like diving into the snow at any point.